Today was a proud day for Singapore. 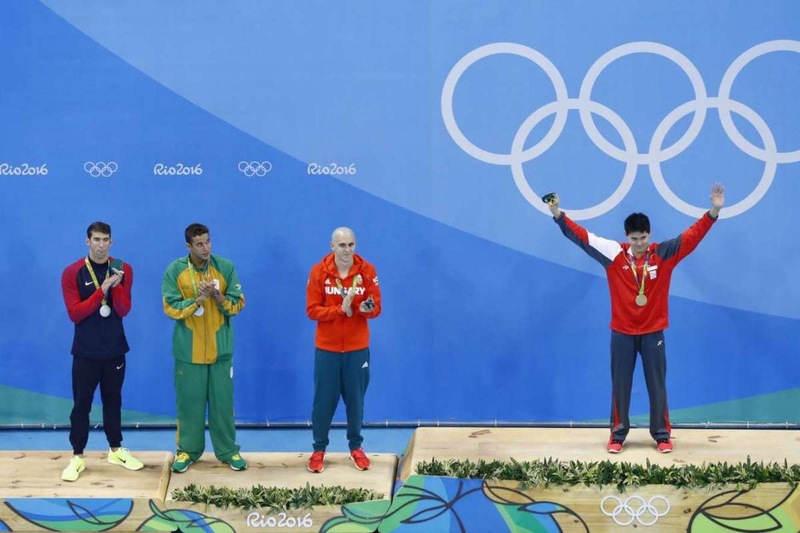 Joseph Schooling made both Singapore and Olympic record history with his awesome 100m butterfly swim. It was the first Olympic gold medal ever for our small country and Singaporeans are all blown away by his decisive win today.There must have been a collective roar at 9.17 am Singapore time across the island as many tuned in to watch this epic race. I was amused when a friend posted on Facebook that she was going to cook curry for dinner to celebrate this win. Unfortunately by that time I had already started on this beef cheek recipe and my only response would be to say that I dedicate this beef cheek recipe to Singapore’s golden swimmer beefcake 😄. Picture from Straits Times – Schooling beating 3 other greats. “Schooling is important to the nation! Schooling brings joy and pride. Schooling gets you ahead of others! But back to the beef cheek recipe…I had a dinner tonight for 10 (and also had to feed 3 other family members on the side). I had planned a big meat dish to feed this small horde. So when I was at Foodie Marketplace I was vacillating between the oxtail and the beef cheeks, both of which cost $1.30 per 100g. So in the end I figured the beef cheeks were more worth it since they were all meat and no bones! In the end I ended up buying 3 kg of meat and literally filling my 6 quart Instant Pot to the brim. Pieces of seared beef cheeks. 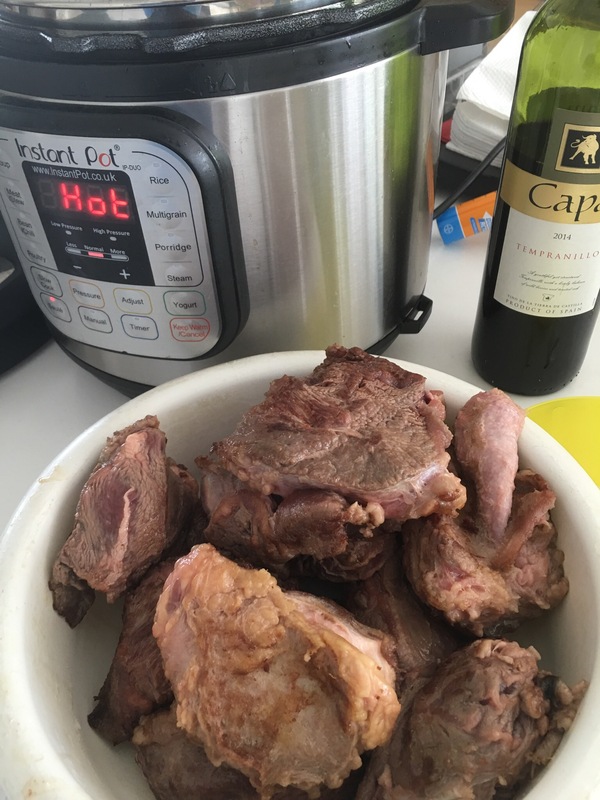 I don’t know why I am surprised every time, but whenever I do a meat dish in the Instant Pot, I am blown away by the melting tenderness of the meat. Even kid#2 who has been unhappily moody lately while on a soft diet since her braces were recently tightened, managed to eat a good amount of beef and cauliflower mash. And the flavour is still as good as a traditional slow-braised version. This hearty dish now ranks high on my list of recipes that is both satisfying and value for money. Soak the porcini mushrooms in 1 cup of boiling water and set aside. Put the Instant Pot into sauté mode. Add 2 tbsp olive oil to the pot. When hot, sear the pieces of beef cheeks on all sides, then set aside. Sauté the onions for about 3-4 minutes. Add the carrots, celery and garlic to the pot and sauté further. When fragrant and softened and slightly caramelized, scoop the vegetables out of the pot and set aside. Add the beef cheeks back to the pot, carefully arranging the pieces of beef to fill the pot neatly and as closely together as possible to maximize space used. Put the vegetables on top, adding the porcini mushrooms in their soaking liquid, wine, and beef bone broth till the meat and vegetables are submerged. Add the thyme, bay leaves and black peppercorns in their spice bag, making sure that the herbs and spices are well submerged in the cooking liquid. Cancel the sauté setting and close the pot, putting the valve into the sealed position. Put on pressure cooker mode for 45 minutes. Allow normal pressure release (NPR). Open the valve and the Instant Pot cover. Carefully pick out the thyme sprigs, bay leaves and spice bag and discard. With a slotted spoon, remove the meat and set aside. With a hand blender, pulse the vegetables in the soup. Add the molasses and cocoa powder, stirring well. Put the pot back on sauté mode and allow the soup to reduce for about 1/2 hour. Return the meat back to the pot. Put the pot into “keep warm mode” till you are ready to serve. 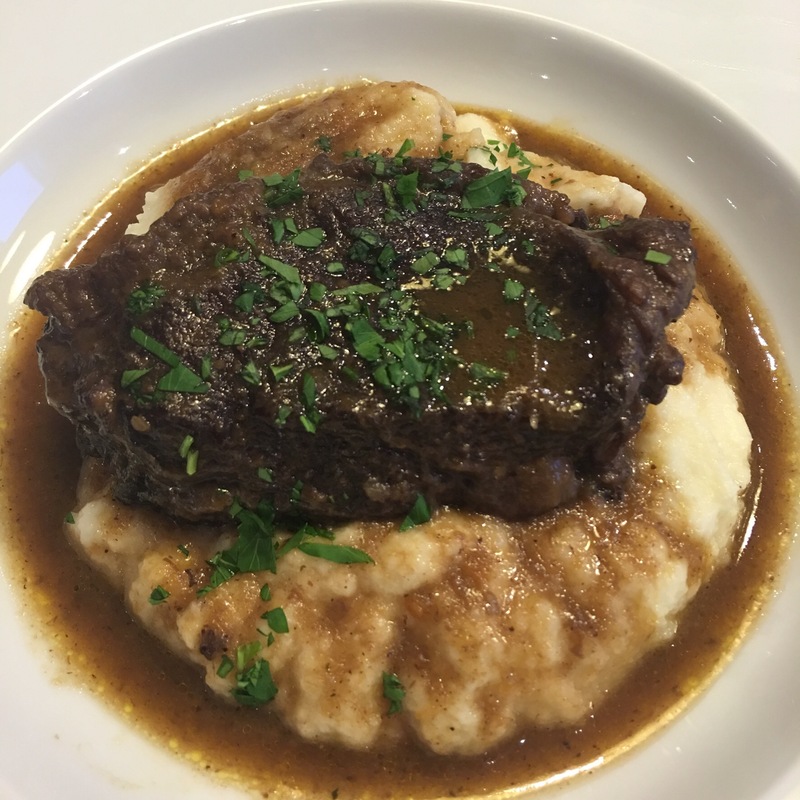 Serve the beef cheeks and gravy over some cauliflower mash and drizzle the chopped parsley on top for garnish. tomorrow. 22/02/17. One thing though naughty person. Not using your own homemade beef broth. It’s easy you have an IP. Actually I usually have some beef broth or chicken collagen stock on hand that’s made in the IP! OK i’ll let you off this time (Ho! Ho! ) Making it tonight. rice and pak choy. I don’t know if you would have rice because of carbs.Speak tomorrow with update. a great recipe. Keep them coming please. Yay! Glad it worked well – I was a bit nervous because a recipe can be interpreted in so many different ways. help. You seem as if you are more experienced. What I need Is tried and tested recipes which yours seem to be. Are you in Singapore I’m in the UK. Yes – I’m in Singapore so I had a friend lug home the IP from the U.K.! Either these are some worthy onions, or your autocorrect has done a little overtime.